Thoroughly wash potatoes, pierce with a fork and place in oven on a baking sheet. Cook for 30-45 minutes, or until soft and easily pierced with fork. Cut potatoes in half. Smash 1/2 of each potato over a tortilla. 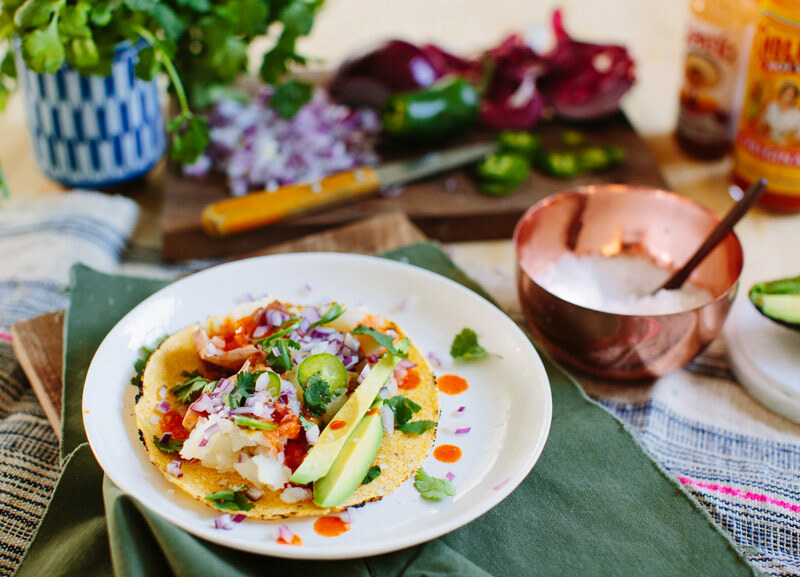 Sprinkle each taco with red onion, add jalapenos and avocado slices. Garnish with cilantro and generous amounts of hot sauce. Top with a sprinkle of Maldon and serve immediately. Looks amazing and so simple Sarah! I love it! Spicy tacos, my fave. Looks delicious!! But most importantly, I need to know where you got that tablecloth (kitchen towel??) with the hot pink stripe!! Love it! 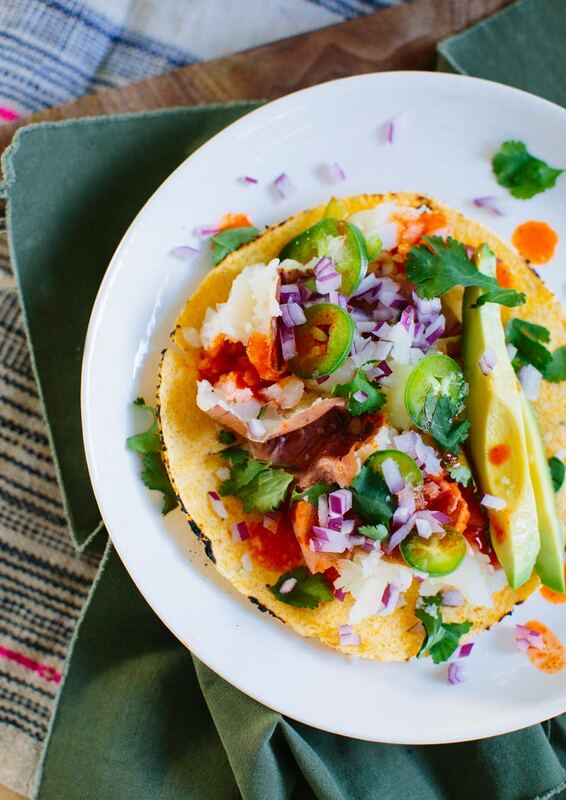 Well, this is a different take on potato tacos! 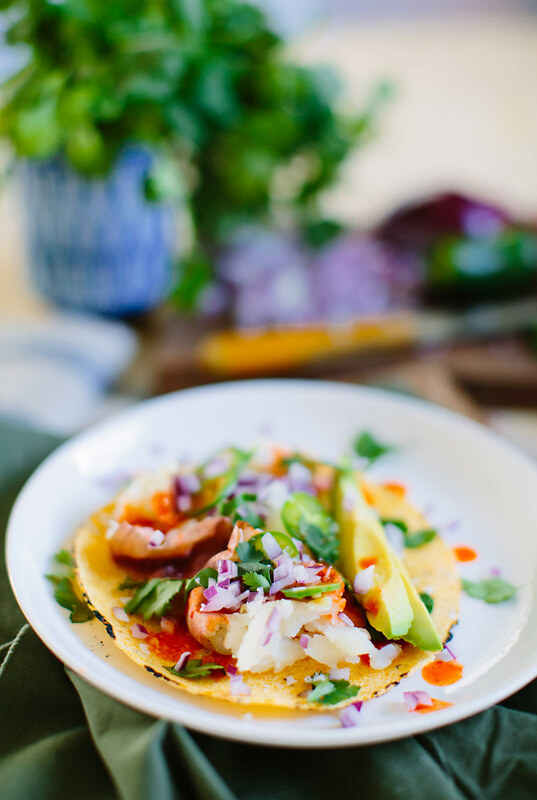 The only ones I’ve had have a mashed potato filling with Mexican cheese, corn tortilla folded and deep fried–they’re delicious but I am loving this fresher (and lighter) take on the potato taco! Those two hot sauces are easily found in local stores, too, yum. Oh congrats on the new home!! I can’t wait to see the before and after pictures!! Paining can be fun but sooo time consuming! These potato tacos are great!! Thanks for sharing! Oh my!!! These look insanely good! And super easy! I’m definitely putting these on the rotation! Thanks for the inspo! how exciting! i cannot wait for the photos! congratulations!!! Avocados are among my favorite foods (they help me with my heartburns) and I really love tacos, but I often fond it difficult to eat them in an elegant way. They are always falling apart, the sauce is all over my hands while I try to catch pieces of veg falling down. 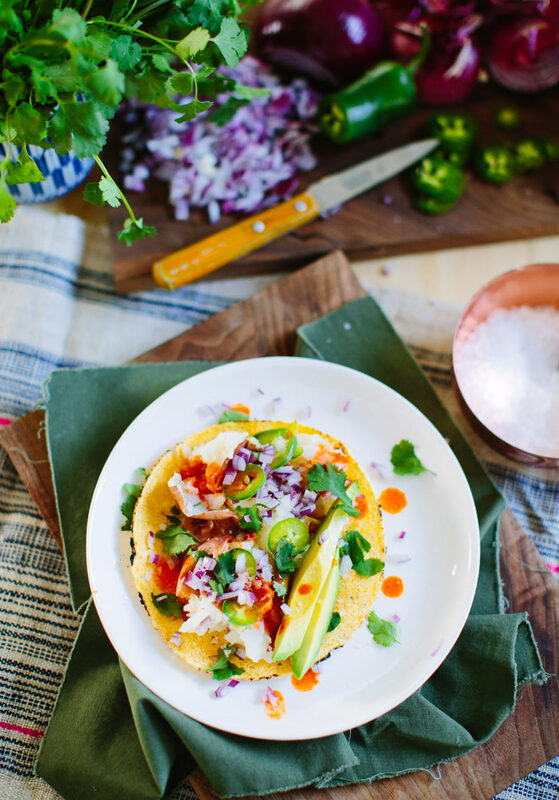 While simple, these tacos still manage to look elegant and vibrant. These will definitely be making it onto my lunchtime menu. Having read this I believed it was extremely enlightening. I appreciate you spending some time and effort to put this article together. I once again find myself personally spending way too much time both reading and posting comments. But so what, it was still worthwhile! This article is an inspiration for me.